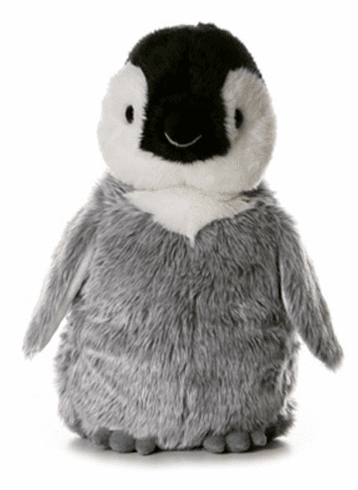 No need to travel to freezing temperatures to get this 12 inch plush Penny the Stuffed Emperor Penguin by Aurora. It has soft, gray fur with a black head, white face, and a white chest. The black eyes look to the black vinyl beak and give it an adorable appearance. Gray vinyl feet put the final touch to this stuffed penguin. Who knew a bird that can't fly would look so cute! As with all of Auroras' plush products this meets or exceeds all US safety standards. Surface washable; for ages 3 and up.